170 x 120mm. 64pp. Perfect bound with foil blocked matte black covers. 400 copies, 25 of which are signed and numbered and contain additional holograph material. The poems in Dark Islands are full of wit and play, acute in their description of the details of contemporary urban – and digital – life. But the real life force in them is a longing for encounters with a transcendent, revealed truth. The struggle for an authentic expression of those encounters produces poems that are beautiful and profound. 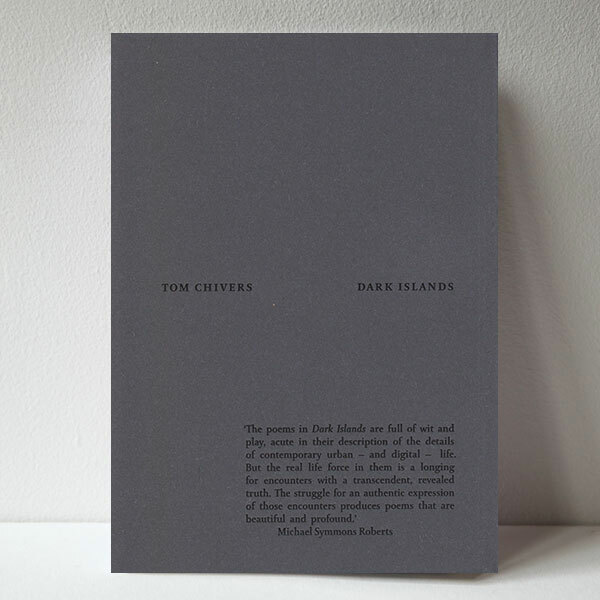 The poetry in Tom Chivers’s Dark Islands has a lot of balls … in the heady juxtapositions of historical detail, digital life, garish alliteration, crisis (both economic and existential), along with bawdy humour, relentless similes, deft leaps in register, and moments of eloquent profundity. The poems of Tom Chivers’ new collection are located right at the centre of our contemporary concerns. The conditions necessary for the work to be produced, our own social and economic climate, are key to the poetry itself, but here are open to the writer’s acts of play, subversion and resistance. Dark Islands is unlike any other poetry collection you’ll pick up this year … Chivers’ poems work in forensics, clawing back the pieces that help us make sense of the whole: they are not broken jetsam but carefully honed fractals. This is both a celebration and a critique of the city, combining the buzz of digital culture with a dark foreboding and a sense of colonial history which is coming home to roost. There’s a sense of speed and movement about the whole project which both excites and disturbs and also a questing desire for some sense of stability, even certainty, amid the transient noise and menace. Dark Islands [takes] the reader on a voyage through modern, mythic urban life. The landscapes presented here are dark indeed, although a numinous glow leaks out at the margins. A rich collection of poetic islands in the choppy waters of modernity. Tom Chivers transmits with often dazzling language a vivid and troubling vision in which the old and modern Thames takes centre stage, against a backdrop of the banking crash and the digital world … The poetic fireworks on the reverse-printed pages of this collection light up the horizon. Dark Islands is an intriguing and often disturbing sequence of poems which is clearly revealed as the work of a London poet haunted by landscapes, hidden histories and constant movement.